We headed for the next adventure on July 18, 2017. Breaking up the trip to Cortez gave us a three night stop in Montrose. The drive once again was very scenic. 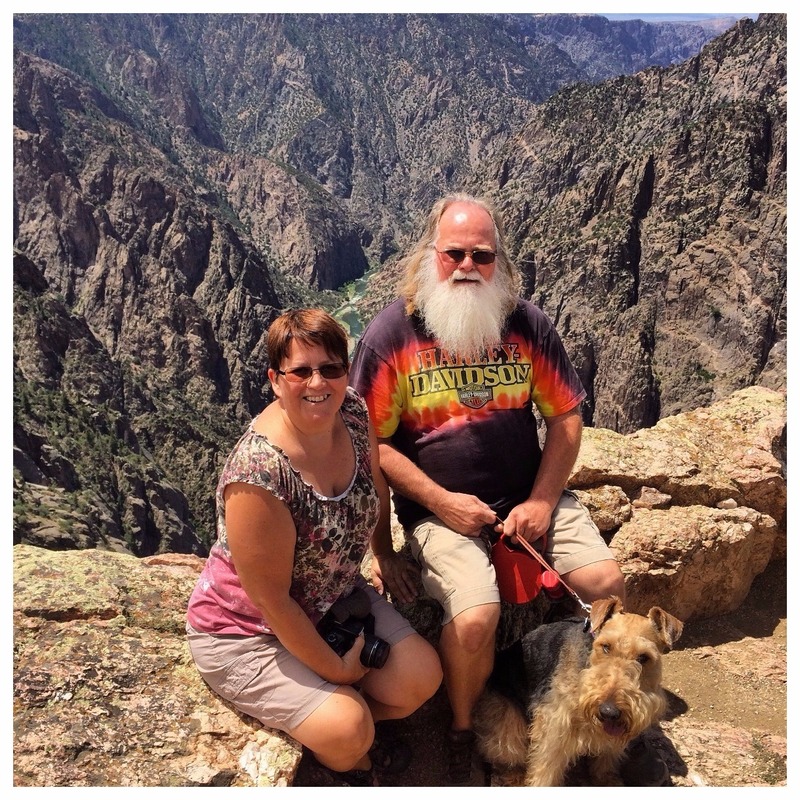 We went up over the mountains - climbing to 10,000 feet and then down through the valley. 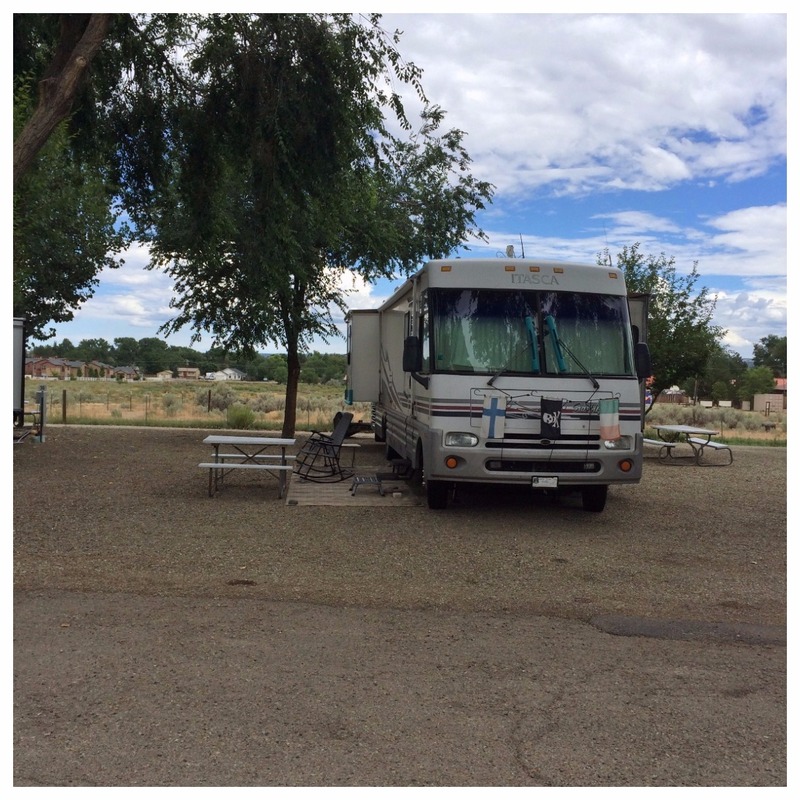 We stayed at the Centennial RV Park. The park has 60 sites, ten in each row. With the exception of the end sites they are all buddy sites, but the grass area in between them is very wide. We were in site 50 which is an end site so we had no neighbor and lots of room. All sites are pull through with full hook ups and a picnic table. Even though the campground is on Hwy 550 the traffic noise was minimal. The park was well maintained. WiFi was weak, our Verizon signal was good. We paid $54.42 a night with no discount. 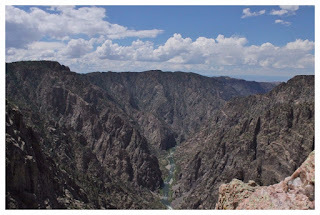 Black Canyon of The Gunnison National Park is what we explored while here. Wow! There are two main roads in the park. One takes you along the South Rim of the canyon with overlooks offering marvelous views of the canyon and the river. 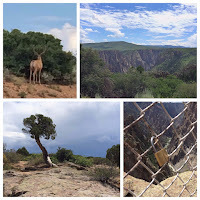 Not only did we have great views we saw a large antlered deer, the trees were a sight all in themselves and we found another love lock. 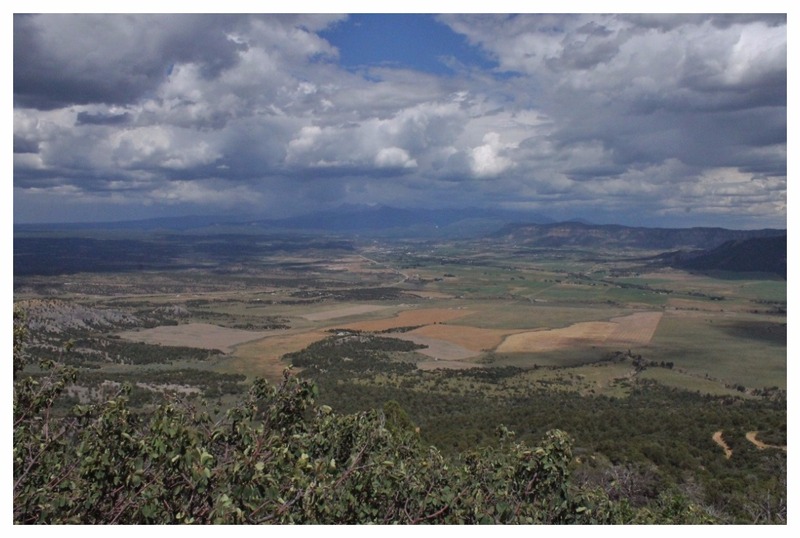 You would think each overlook would give you about the same type of view - but oh no each one has something different. The painted rock wall was so cool. 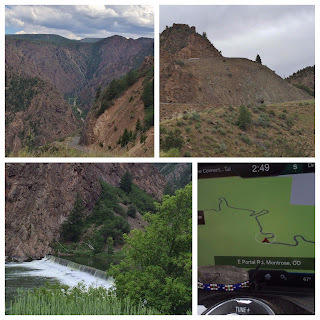 The second road takes you down to the Gunnison River. You twist and curve all the way down. Sections of this road leave the park and there are a few houses along the way. What a view they have, but not sure what it would be like in the Winter! 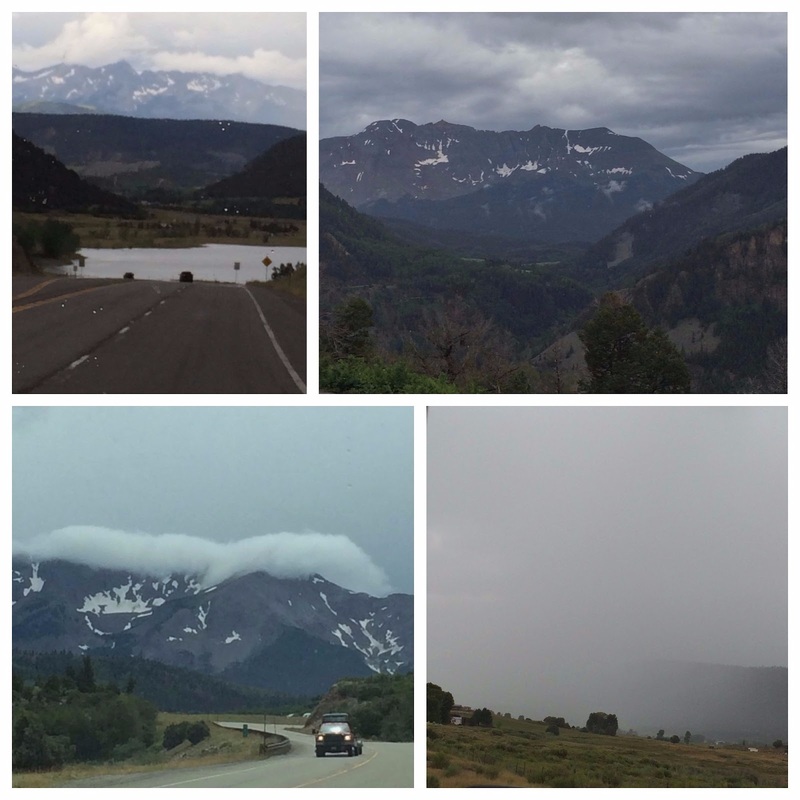 The top left picture is the roadway down at the bottom - top right is the road going back up - made us think of a tiered cake. 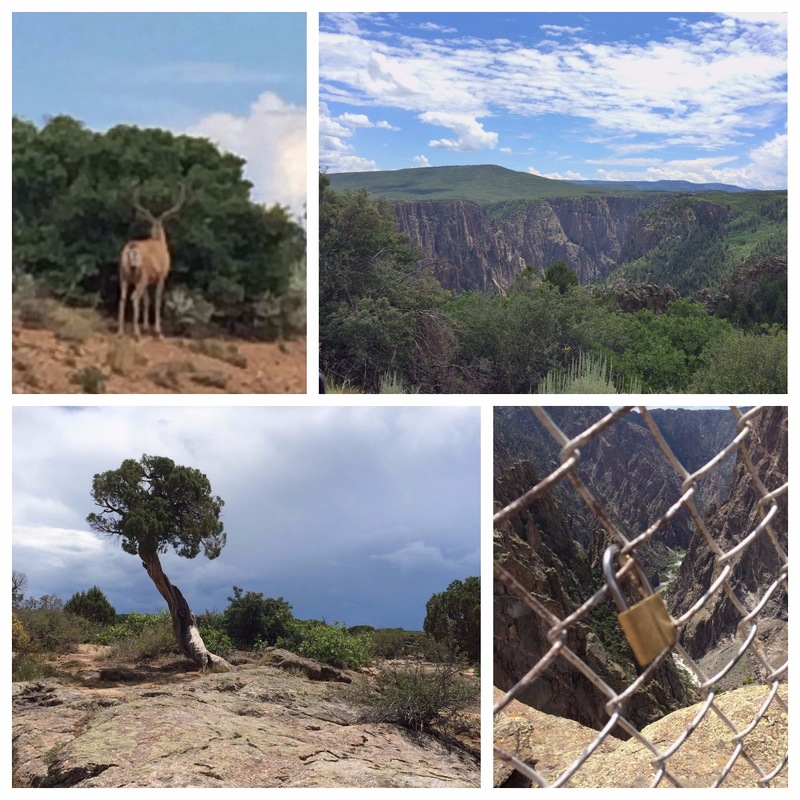 Bottom left is the diversion dam which is all that can be seen of the tunnel that was built from 1905 - 1909 to divert water into the Uncompahgre Valley. It was a daunting task to bore through 2000 feet of water-filled rock. Work was done around the clock, manually and by candlelight. First the top layer of 6-8 feet was cut, leaving a bench for the workers to stand on. Then the bench section was cut out to finish the 12-foot tunnel space. One miner would hold the drill and rotate it while a second one would use a sledgehammer to drive the drill into the rock. Despite the good pay most workers only lasted about 2 weeks. 26 men died during the four year process. 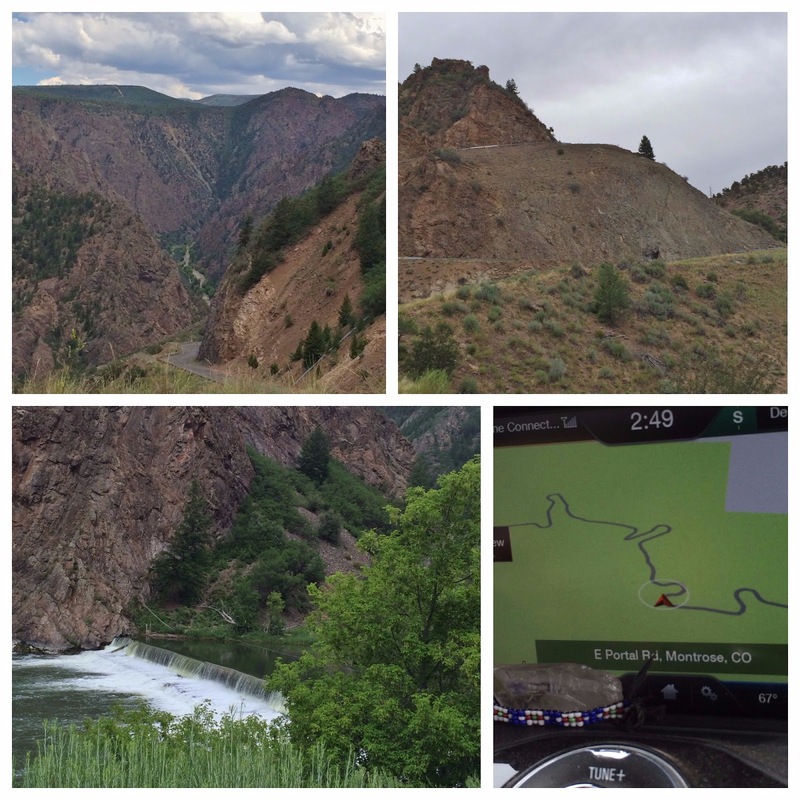 Once again our drive on July 21, 2017 took us over mountains, through valleys, past rivers and lakes. We did pass Wilson Mountain, which of course Nancy was thrilled by and we loved the "lizard" cloud resting on top of a mountain ridge. 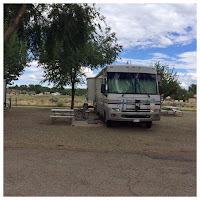 We stayed at the La Mesa RV Park, which is right on Hwy 190 but there was very little road noise. The park has 35 sites and is all gravel. Ours was a pull through with full hook-ups, fairly long, level and plenty wide enough. The laundry room has one washer and one dryer, so our laundry was done in town. The WiFi was good and our Verizon signal was good. We paid $29.54 a night with our Good Sam discount. One of the best things of this stay was when Cathy and Don, the camp hosts came out of the office and sang Happy Birthday to Nancy. 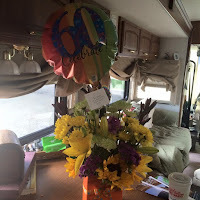 Her best friend Gail - they met in Kindergarten - called the office and asked about a place for flower delivery (beautiful ones were sent) and she got more than she bargained for with the song as an extra bonus. 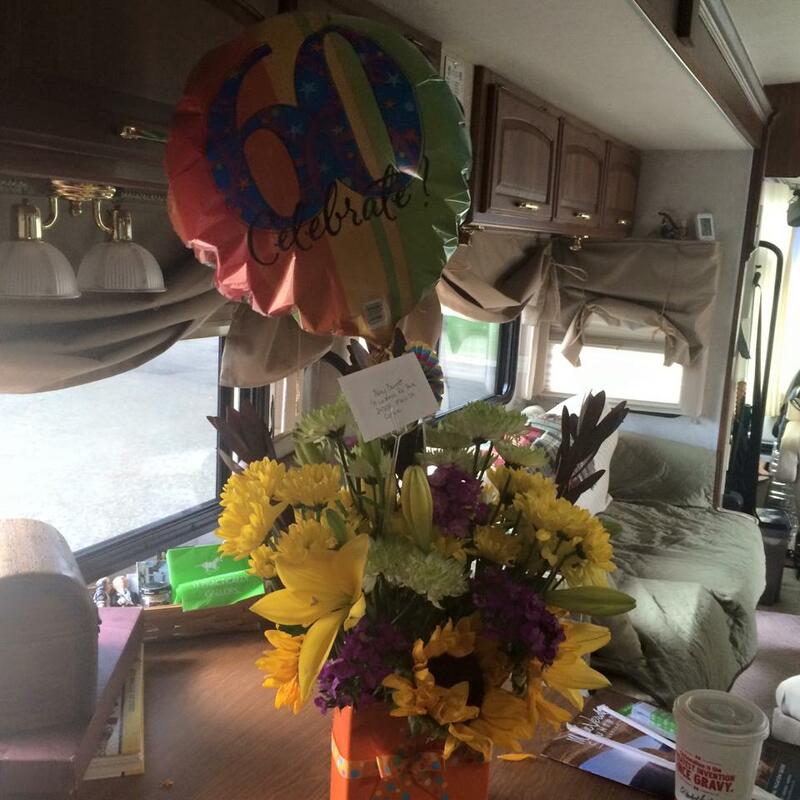 It helped to make Nancy's 60th birthday that much better. We found a couple of Roadside Oddities in Cortez. The Vultures cleaning out the guts of the car was the best. 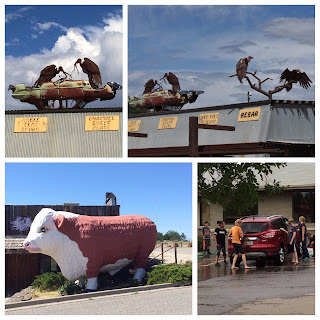 The big cow sits outside of an out-of-business BBQ place. We also got our car washed by a group of middle-schoolers raising money for a trip - well actually the adults did most of the work. Anyone surprised? 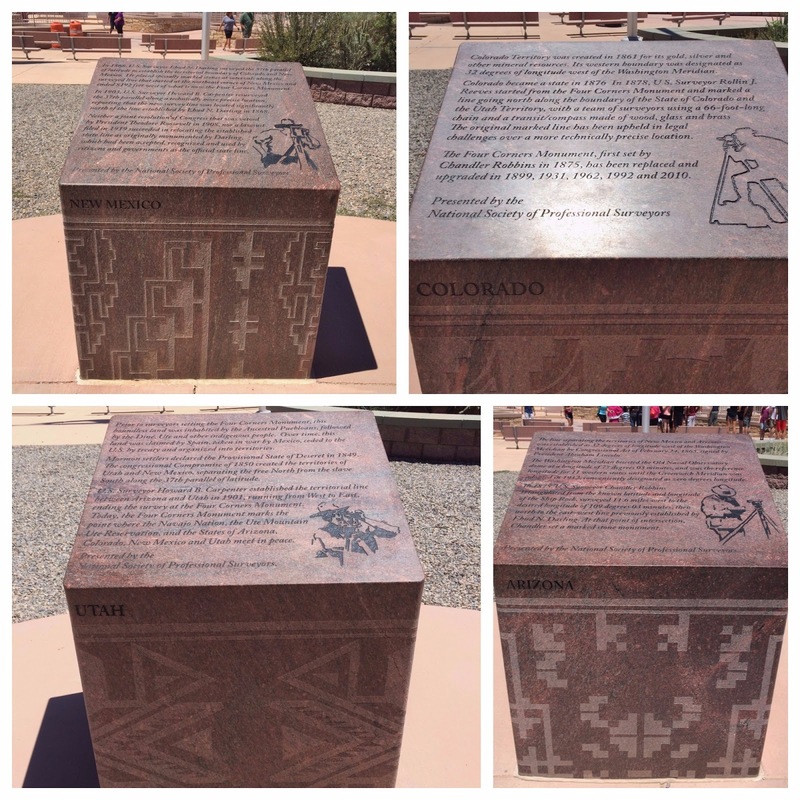 Four Corners Monument marks the only spot in the United States where four states intersect at one point. The Navajo Nation runs the monument and offers handmade jewelry and crafts along with traditional Navajo food. The original marker was put in place in 1912 and was a simple cement pad. Today it is a beautiful mix of granite and brass. 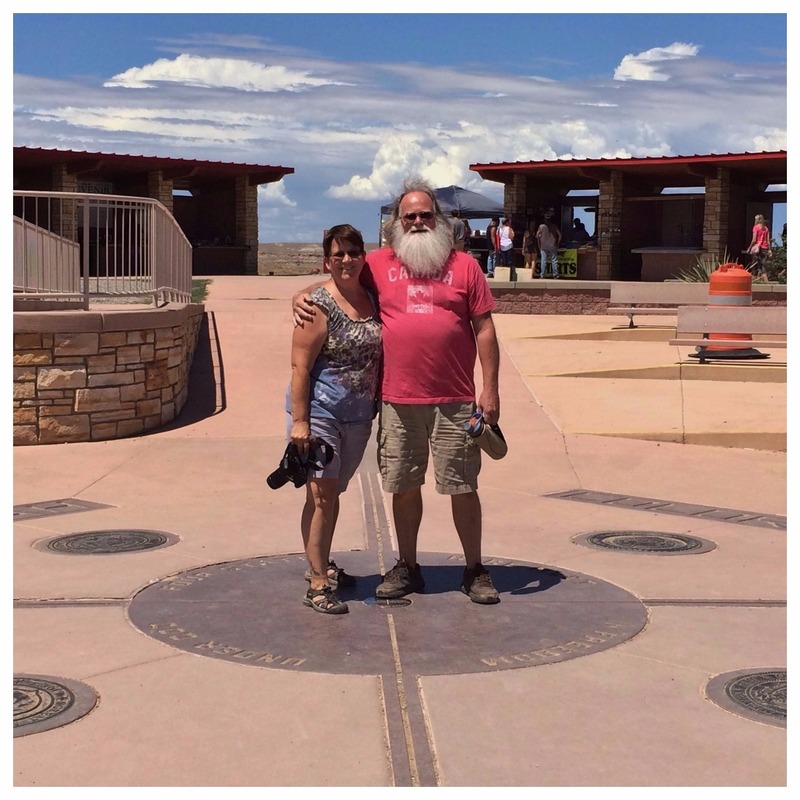 When you are in the center of the marker you are standing in Utah, Colorado, New Mexico and Arizona. 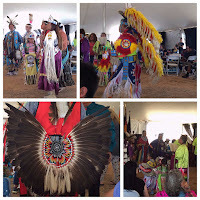 While we were there we also got to watch tribal dances being performed. 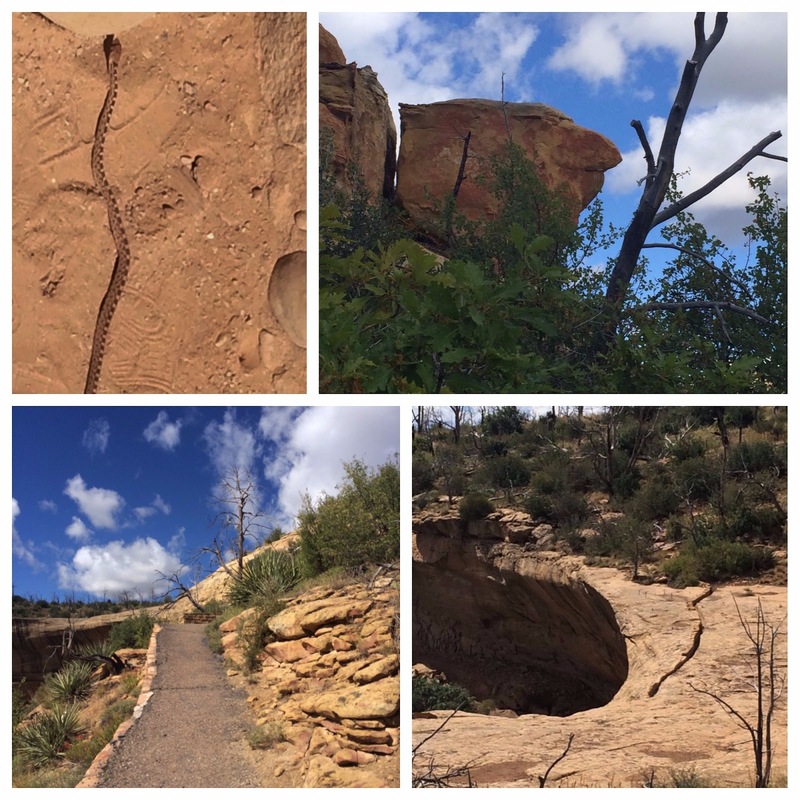 Mesa Verde National Park was just a few minutes down the road from our campground. The park is so big and the roads so twisty that it takes a couple of hours to get from one end to the other. 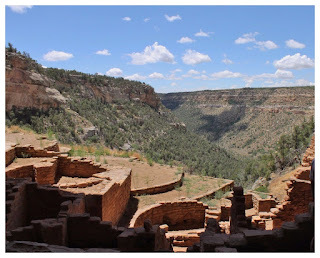 Around 550 AD the Ancestral Pueblo's moved to the Mesa Verde and for over 700 years they and their descendants lived here. They built elaborate communities in the shelter of the canyon walls. A number of those communities still survive today, standing witness to the people who called this home. We were in awe of the craftsmanship of the structures. Our first day in the park we drove about half way through seeing the two valleys on either side of the park. The second day we boarded Mielikki for the day and went exploring and took a tour of the Long House. hiked to Step House. 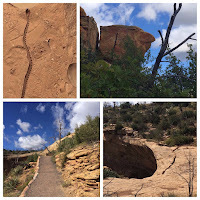 The trail is a little under a mile but is steep and rocky in places. Step House is nestled into a northeast-facing alcove. Here you see structures from two different time periods. 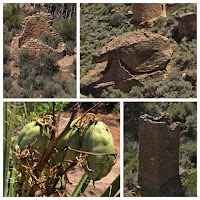 The reconstructed pit-house was originally built around 620 AD and the small multi-story pueblo was built centuries later. We are so glad we decided to take one of the tours. There are three tours you can take, but it is near impossible to do them all in one day. One of the tours included climbing a 32-foot open ladder and we were pretty sure Nancy couldn't handle that so we opted for the one with two short ladders instead. Our tour guide for Long House was Ranger Kaitlyn and she did a fantastic job. There were close to 30 people on the tour and they came from all over the world. 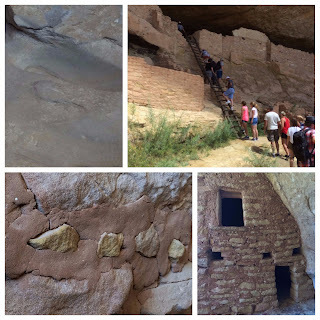 You start off walking across the Mesa Top which is where the Ancient Pueblos first lived and where they grew their crops of corn, squash and beans. 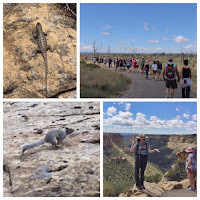 We spotted a number of lizards, in many shapes and colors and the rock squirrels were everywhere and very vocal. You enter Long House by climbing two 15-foot ladders and entering what is believed was a gathering room where work was performed. There are large groves in the rock where repetitive grinding was done. The mortar is really interesting and the structure is almost modern in places. Long House is 298-feet long and the village included about 150 rooms, 21 kivas, upper storage rooms and may have housed as many as 175 people. 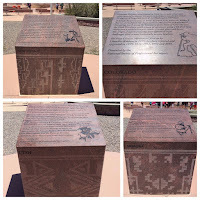 It is also believed that it was a community gathering place for people all over the Mesa. There were many communities within a days walking distance of each other. The formal plaza in the center is very large and is thought to have held ceremonies. 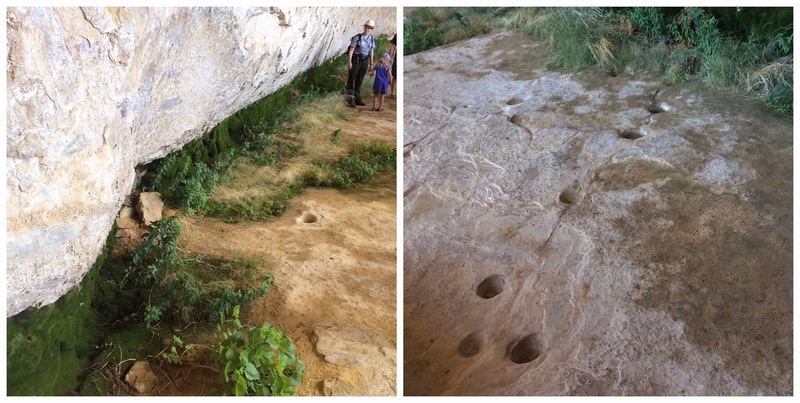 There are three large foot-drum pits that were covered in animal skins and then they banged on them with their feet. Along the back wall is a natural spring. There are a number of small round basins that were carved into the stone with channels from one to other to collect the water. 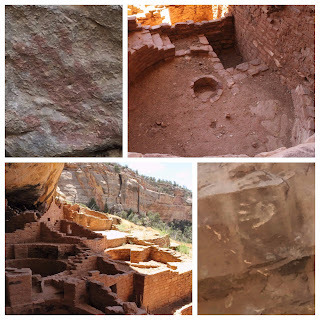 The spring is on the wall behind the Kiva's and the ceiling has a number of rock paintings. There is one of a 6-fingered hand. This person would have been considered to be a more spiritual being. 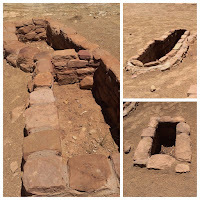 The large hole in the center of the Kiva would have been the fire pit, the smaller one was considered a connection to the ancestors and was never stepped on or blocked. You have to wonder what life was like for those who lived here. How difficult was their daily life? What sorrows did they have, what triumphs? In many respects you have to think they were much like us today, they laughed and cried. They celebrated and mourned. Even though we know they picked this spot for something other than the view - it is a pretty sight. 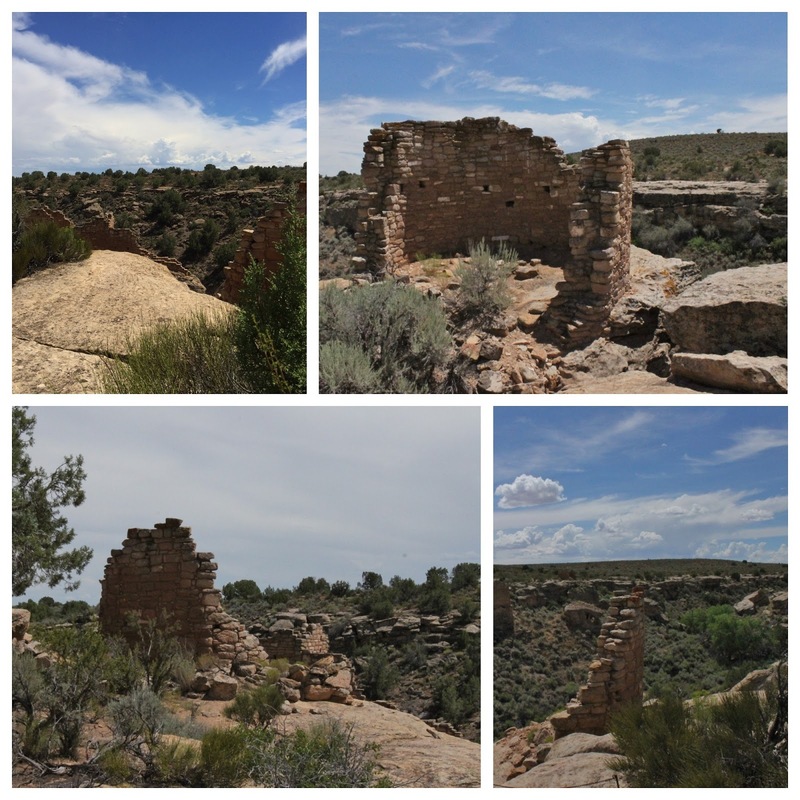 You might think after touring the cliff houses at Mesa Verde National Park that Hovenweep National Monument would pale in comparison. It did not, it may be smaller but it certainly holds its own in terms of archaeological sites. 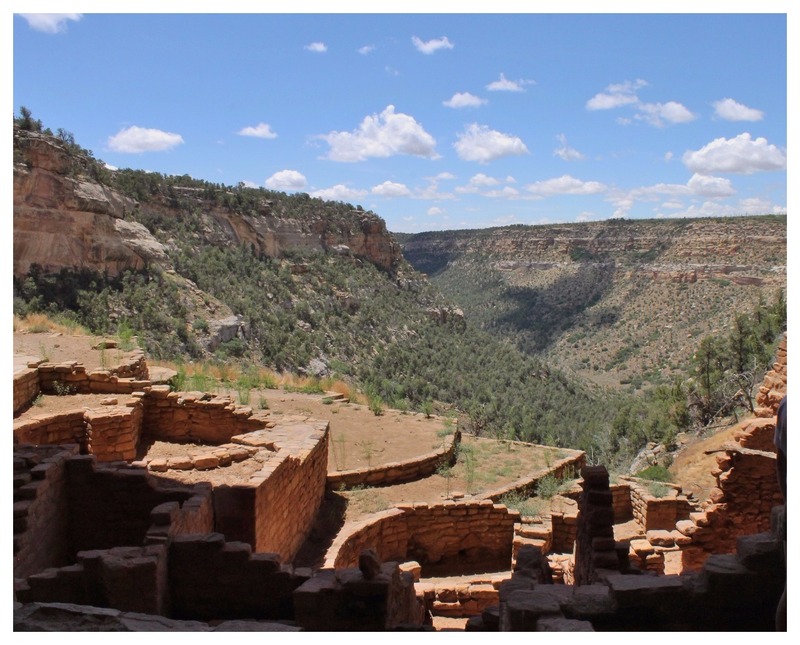 There is a 2-mile loop around the rim of the canyon where the ancestors of today's Pueblo Indian tribes lived. No one has lived here for over 700-years but it isn't hard to imagine a community here. The trail is mostly flat along the rim but there is one section where you climb down into the canyon and then back up the other side. We did have to chuckle at the "wet floor" caution sign. First off rain is a rarity and you wouldn't really call this a floor. 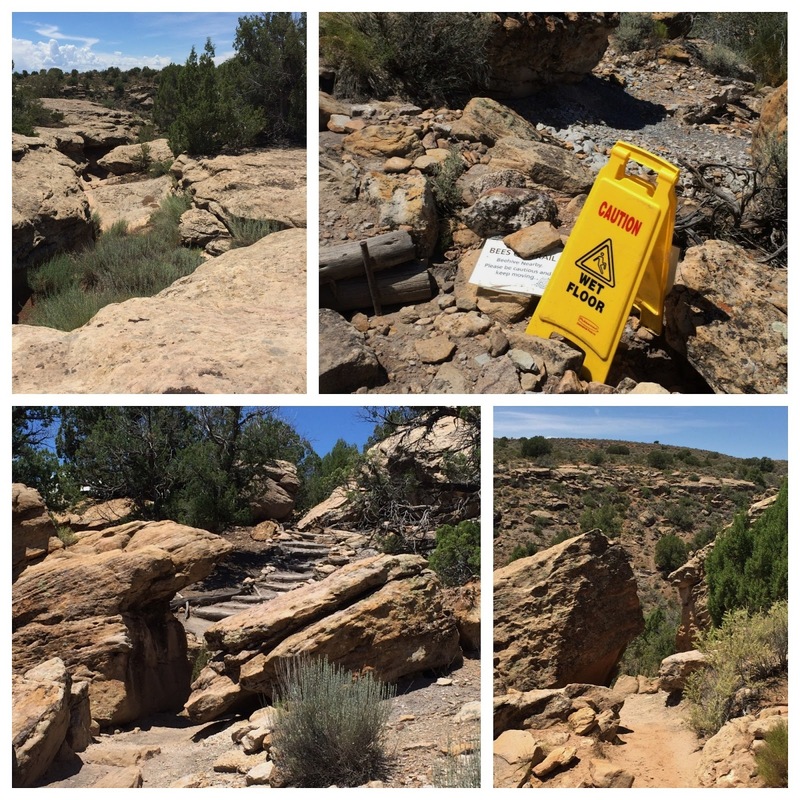 What the caution really was is the sign next to it telling you about ground bees! Nancy stayed far away. 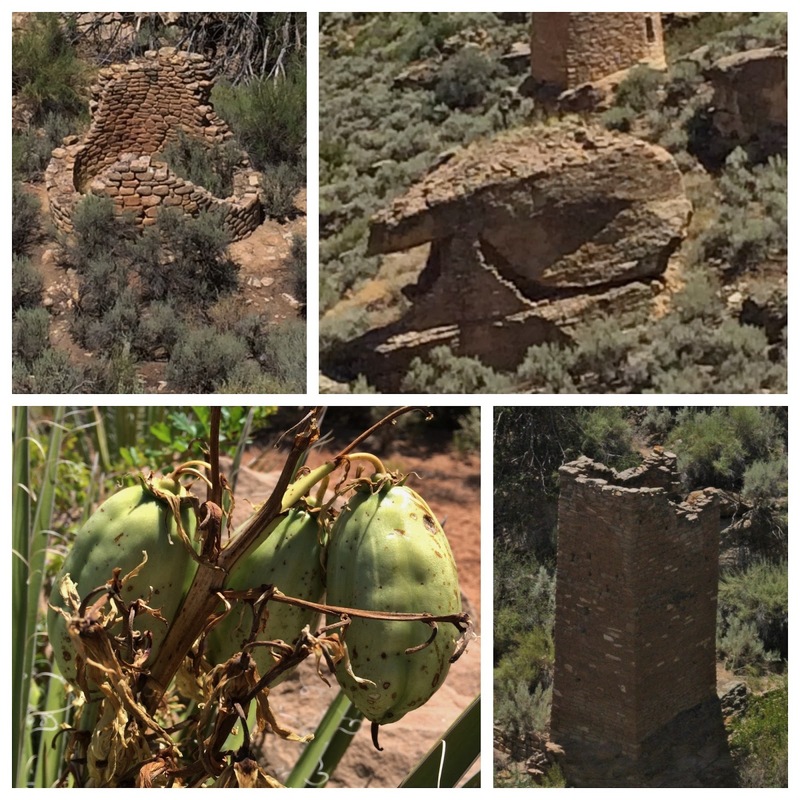 Many of the dwellings are perched right on the canyon ridge and a few others were built on large boulders inside the canyon. 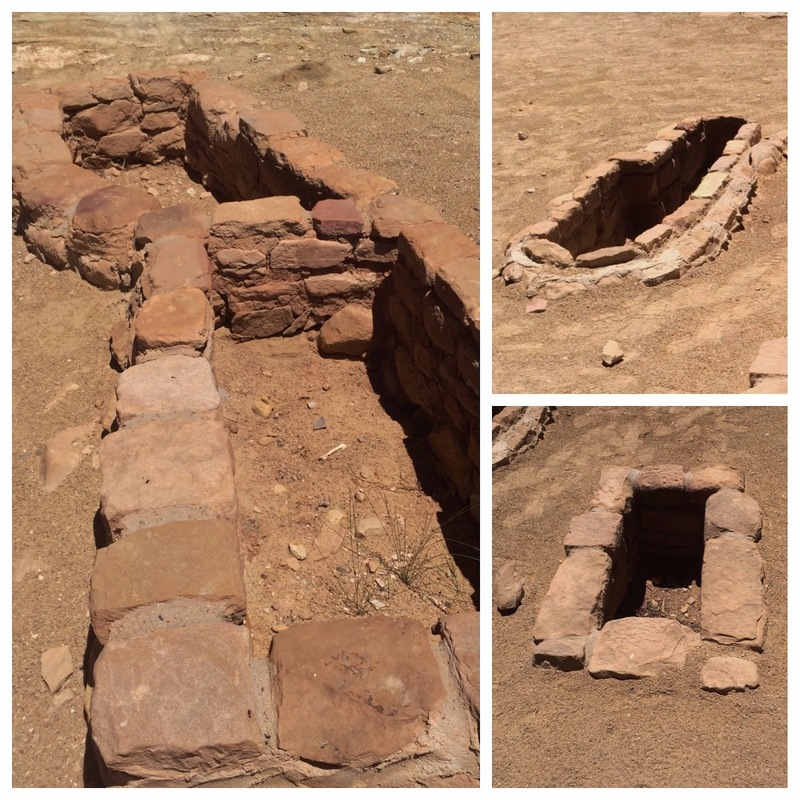 Archaeologists suggest that the people who lived here were protecting something, most likely a water supply. Based on studies of the area these people, like those in many other locations seem to have moved away very suddenly. This may be due to a depletion of resources because of a drought. 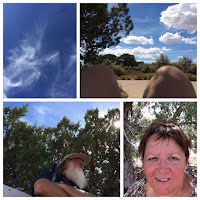 It was beastly hot the day we hiked and Nancy can understand how people can get disoriented in the desert. She got way overheated and was having difficulties breathing, felt very nauseous, and was having a hard time thinking straight. So the last half mile was very slow going as we went from tree to tree for shade. 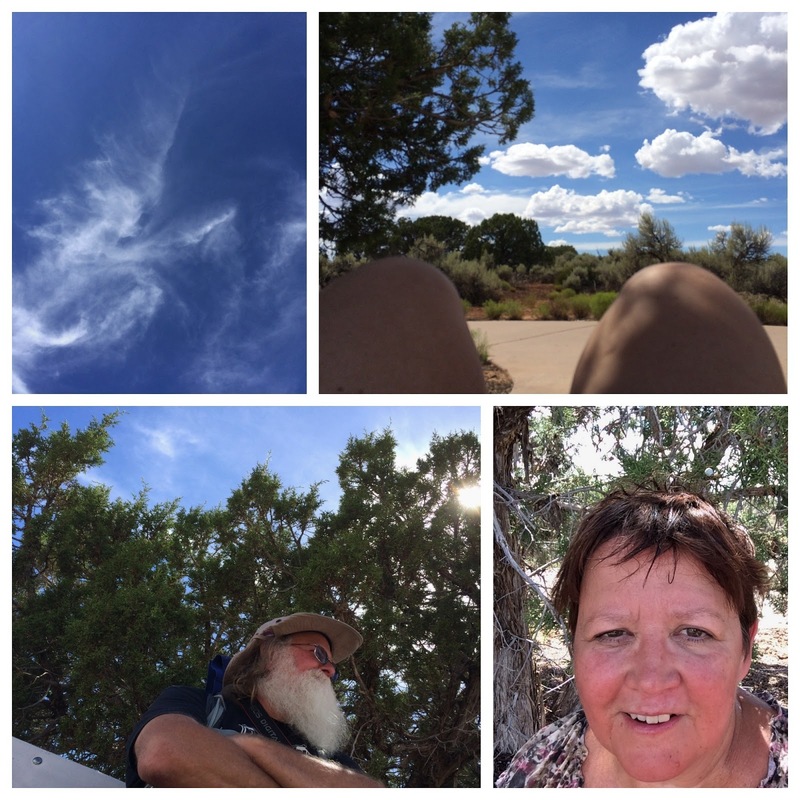 At one spot there was a bench on a cement pad and Nancy took advantage of the flat ground and laid down, which gave her a great view of the sky and clouds. 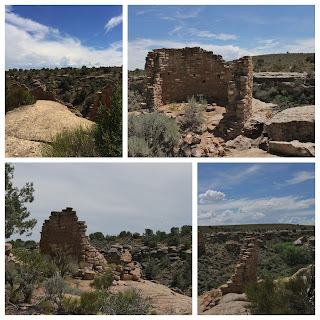 Along with the beauty of the mountains and canyons this stop was an amazing history lesson. here. A tradition Nancy's dad started many years ago when he received his birth certificate and discovered he had been celebrating on the wrong day for almost 30 years so decided he should celebrate for a week. 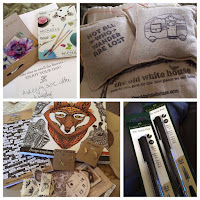 It is great way to celebrate - a little gift or a note each day for a week - who could argue with that? Katrina supplied a whole bag of goodies for Nancy. 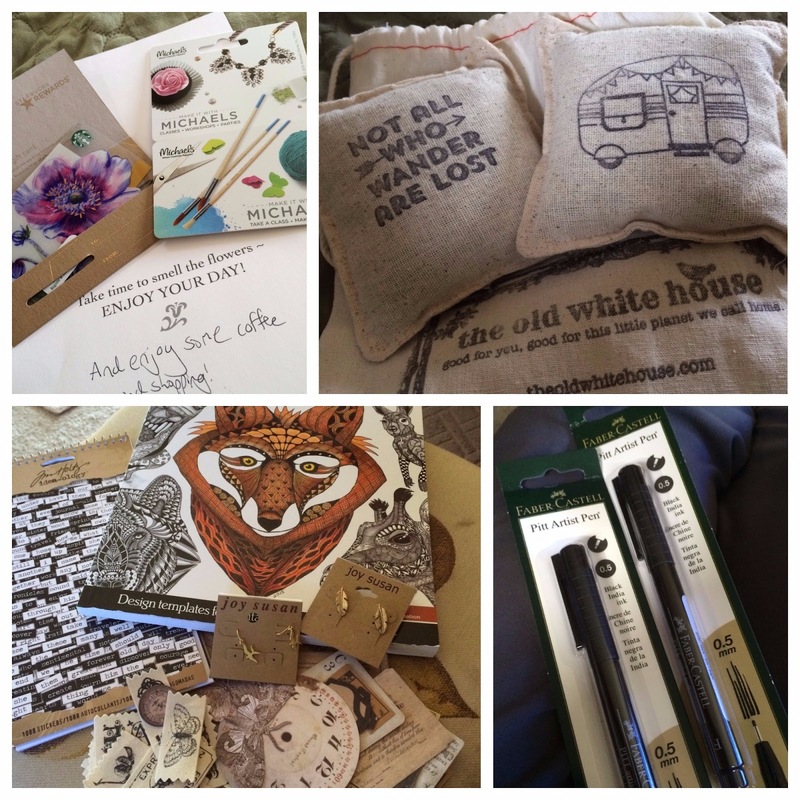 Lots of art stuff, beautiful earrings, gift cards and more. Les and Nancy ate out, had yummy treats and drank some good beer! Next up is Utah! 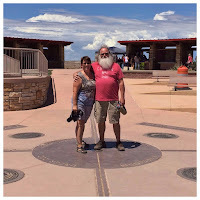 Moab will be home for a week while we visit Arches National Park and more. It has been very hot, close to 100 most days which makes hiking dangerous. As stated above Nancy had a hard time on one of the hikes and both of us were very hot and tired when done with all of the hikes. It is so important to be prepared. - When possible hike early in the day. - Wear a hat and use sunscreen. - Make sure you have plenty of water. 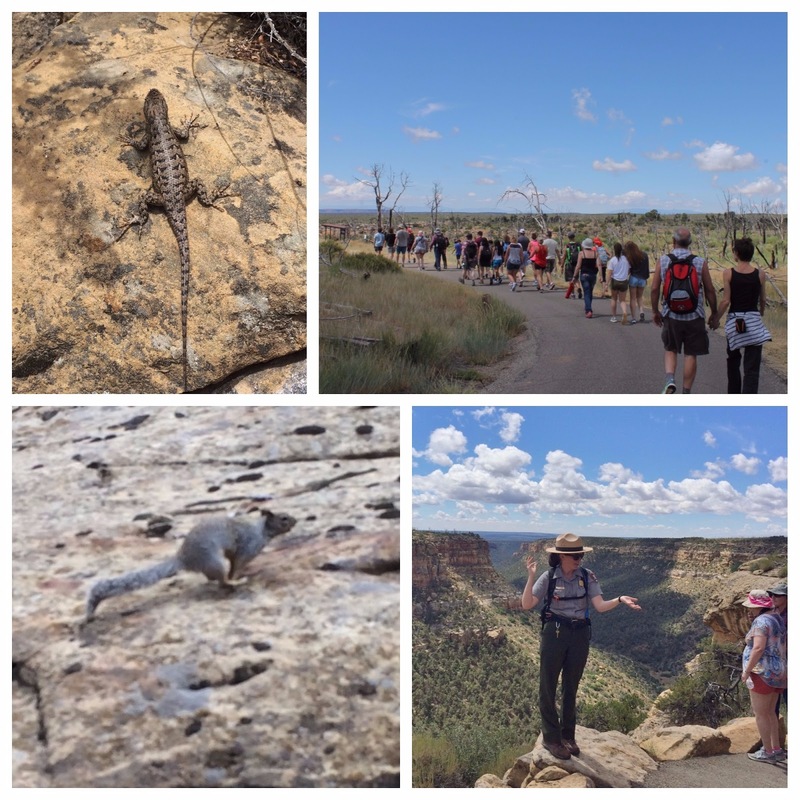 We both have hydration back packs, Nancy's wasn't full when we started out at Hovenweep and that was a big mistake. You want to start off hydrated and stay that way. Take frequent sips of water - much better than large gulps. Your body can only absorb about 16 oz. of fluid an hour. When using a hydration back pack - once you sip the water either blow back into the tube or lift the tube up straight to drain the water out of the tube. This prevents your next sip from being such hot water. - Re-balance your electrolytes with a starchy fruit like an apple or trial mix. Electrolyte drink mixes can help as well. Protein bars work well and travel well. With Les being diabetic we make sure we have things that will bring his sugar back up incase of a drop. Sliced oranges and grapes are good choices. - Listen to your body - a sudden headache, dizziness, nausea, confusion are all signs of serious overheating and can lead to heat stroke. We all want to think we are strong and can keep on going but it can be life threatening - so listen to your body and take a break, get some water, get help if needed so you can get back out there next time.